With so much nutrition advice out there for during pregnancy, it can be difficult to know if you’re following the right diet, eating too much or not enough. Here are some brilliant healthy recipes to try during pregnancy. 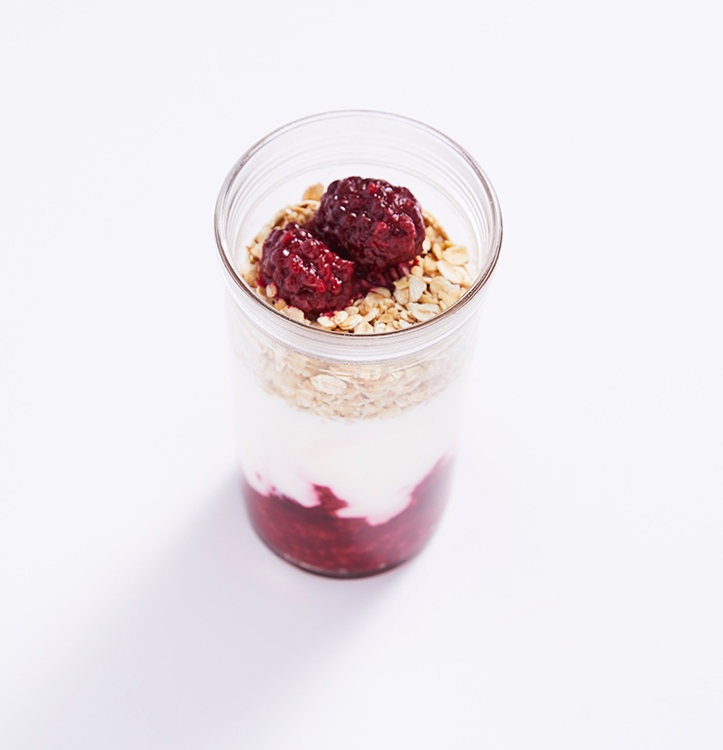 Recipe Allergens: oats and milk. Put berries in a wide, medium pan with the ground and fresh ginger and 2 teaspoons of water and place over a low heat. Cook for about 10 minutes, stirring occasionally, until the berries are soft and mushy. Remove from the heat and leave to cool completely before serving. Add the oats and cook for 4-5 minutes, tossing frequently, until just catching colour. Remove from the heat and leave to cool completely before serving. 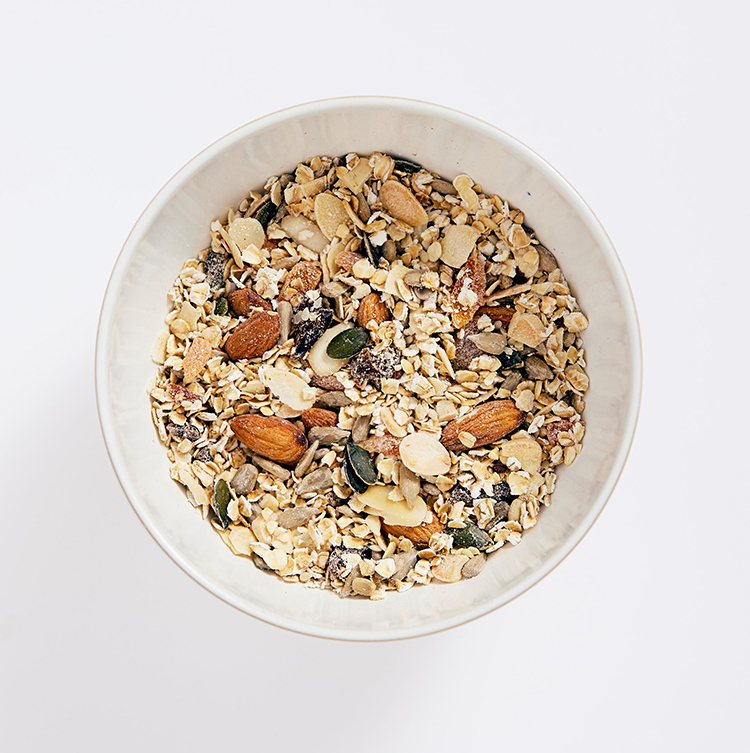 Recipe Allergens: oats, tree nuts (almonds), sesame seeds, gluten and sulphites. Mix all of the ingredients together in a large bowl until evenly combined. Recipe Allergens: crustaceans, eggs, milk and gluten (in flour). Dice the spring onion and add to the bowl along with the sweetcorn, 2 eggs, flour, chili, paprika, coriander, juice of half a lemon and seasoning. Mix well. In a small bowl, mix the crème fraiche, juice of half a lemon, and most of the chopped chives. Set aside. For the poached eggs, heat a large pan of water on a medium heat until small bubbles start to form. Crack the egg into a small bowl, then stir the water to create a light whirlpool and pour the egg in gently. Cook for 3-4 minutes until the white is set, then remove with a slotted spoon and place on kitchen paper to dry. 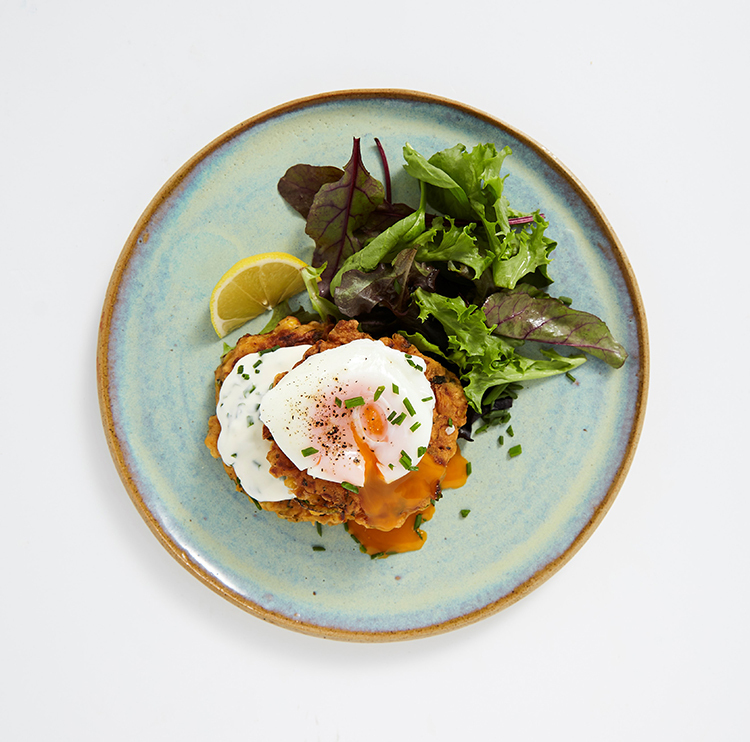 To serve, stack fritters in a small pile and top with a tablespoon of the crème fraiche before adding the poached egg, a sprinkling of chopped chives and a side salad if desired. Recipe Allergens: fish, sesame seeds and soya. Put the quinoa on to cook according to the packet instructions. To prepare the salad dressing, simply put the ingredients along with a little salt and pepper in a screw top jar, secure the lid and shake vigorously. 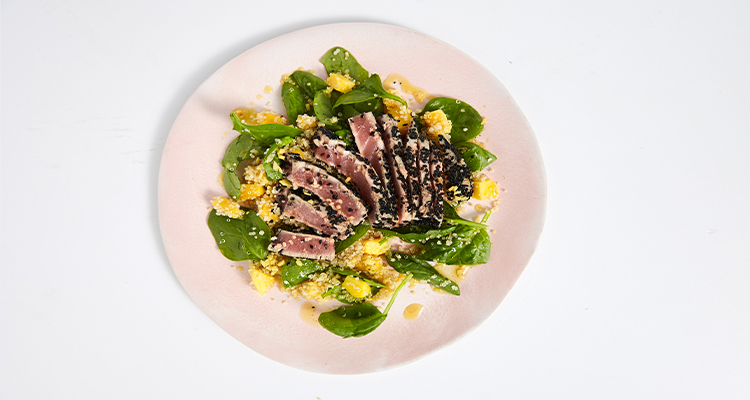 Scatter the sesame seeds on a large plate along with a fair amount of pepper and then dip the tuna steaks in so that they are evenly coated all over. Divide the oil between two large frying pans over a medium heat. If you only have one large pan, then cook the tuna in two batches rather than squish all four in and stew them! Cook the tuna steaks for around 2-3 minutes per side for a medium-rare finish, depending on the thickness of your steaks (it’s fine to eat partly cooked tuna in pregnancy if it’s been frozen and fully defrosted first8). Of course, you can cook your tuna steaks for longer if you prefer. Remove and set aside. Once cooked, rinse the quinoa under cold running water and set aside to cool down completely. Once cooled, toss it in a large serving bowl with the mango and spinach and season to taste. Divide the salad among four serving plates (or four lunch box containers). Place a piece of fish over each salad and then drizzle over the dressing. Recipe Allergens: tree nuts (almonds), milk (feta), and celery (stock cube depending on stock used). Heat the oil in a large sauté pan over a low-medium heat. Sauté the onion for about 10 minutes until really soft. Meanwhile, pop the beetroot in a blender, puree until smooth as possible and set aside. Add the garlic and rosemary to the softened onion and cook for 1 minute. Stir in the barley or rice and cook for 1 minute more. Add a quarter of the stock and stir regularly until it has been absorbed. Then add another quarter of the stock and continue this process until all has been used up and the rice is tender. This will take 20-25 minutes. As the rice is cooking, cook the garden peas until they are tender then drain and set aside. Stir in the beetroot to the rice pan and season to taste. Warm through for a couple of minutes until piping hot, then stir in the drained peas. 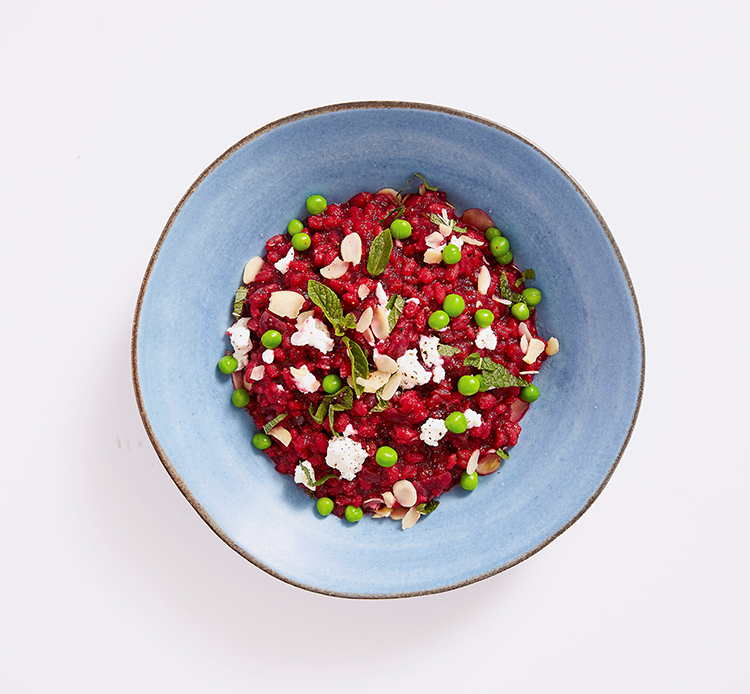 Spoon the risotto onto serving plates and crumble over the feta cheese. Scatter over the mint, flaked almonds and serve. Recipe Allergens: fish and milk. Preheat the oven to 200oC (fan 180oC), 400oF, Gas Mark 6. Bring a medium pan of salted water to the boil and cook the potatoes together for 10-12 minutes or until tender. Alternatively, steam the potatoes, in which case they tend to take on less water, making for a stiffer, drier (and better) sweet potato mash. As this cooks, put the cornflour in a wide pan with a little of the milk and stir until dissolved and smooth. Then add the rest of the milk while stirring all the time. Carefully stir in the crème fraiche and salt and pepper, to taste. Remove from the heat and tip onto a 2.5 litre ovenproof dish (min measures 25cm square and 6cm deep). Once cooked, drain the potatoes well and tip them back into the pan. Mash until smooth with the butter, nutmeg and enough salt and pepper to taste. 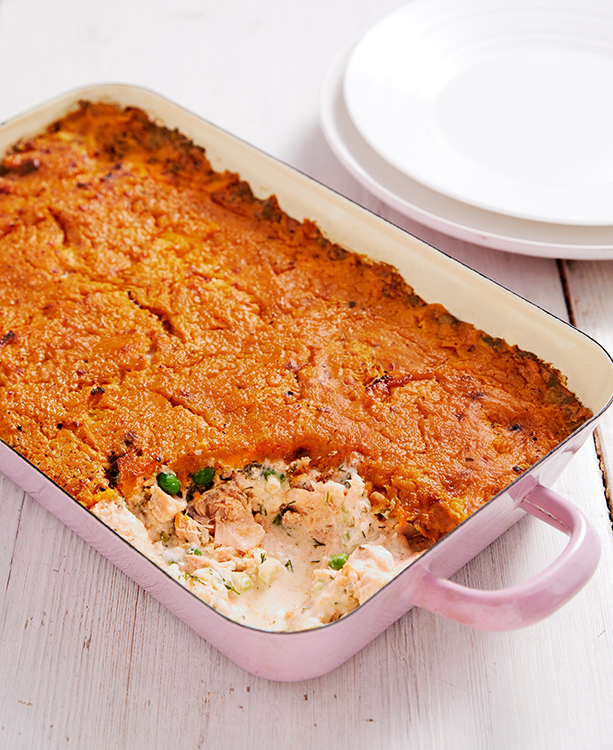 Place spoonful’s of the mash potato all over the top of the fish filling and spread it out evenly with a fork. Grate over a little more nutmeg if you fancy it and pop on a baking tray in the oven for about 20 minutes until the top is just catching colour and the fish filling is piping hot. Serve at once. Recipe Allergens: tree nuts (pistachios), gluten (couscous), celery (stock cube), and milk (feta). Preheat the oven to 220oC (fan 200oC), gas mark 6. Slice the aubergine in half and score it diagonally in both directions to make a criss-cross pattern. Rub the rapeseed oil into the aubergine halves on both sides, sprinkle with half the pepper, and place in the oven for 30 minutes, or until golden brown on top. While the aubergine is cooking, make the couscous. Add the juice of one lemon, two crushed garlic cloves, remaining pepper and the stock powder to a jug, then pour in 150ml of boiling water and mix. Put the couscous in a bowl, add the liquid, stir briefly, cover and leave to stand for 3-4 minutes before fluffing with a fork. Chop the cucumber into small chunks, slice the cherry tomatoes in half and mix into the couscous. Set aside. 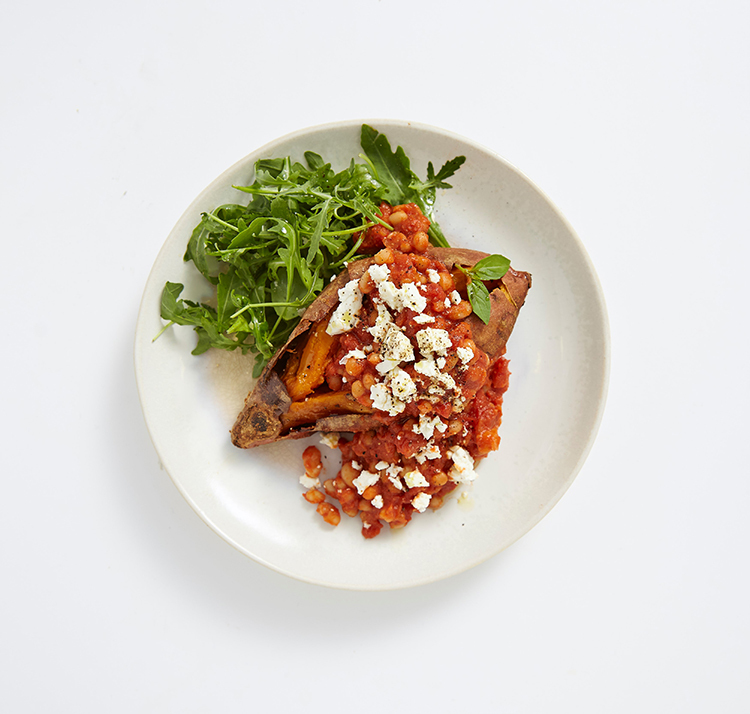 Take the aubergine out of the oven, and if the flesh is soft and golden brown, crumble the feta onto each half and return to the oven for a further 5 minutes. 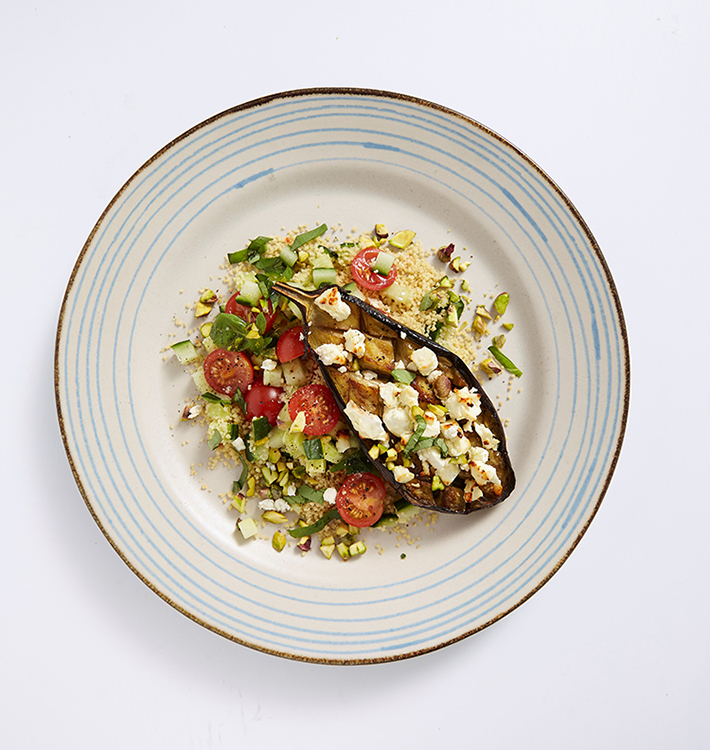 To serve, sprinkle the aubergine halves with chopped pistachio and basil, and add a portion of couscous on the side. 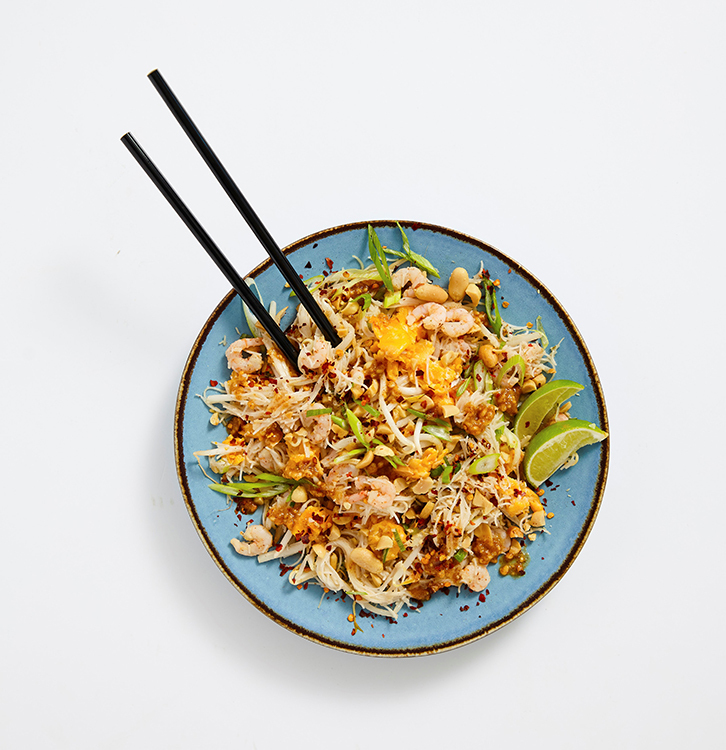 In a small bowl, mix the soy sauce, vegetable stock, fish sauce, mirin, sweet chili sauce, peanut butter and chili flakes with the juice of one lime. Set aside. In a saucepan, cook the noodles according to packet instructions. When ready, drain and rinse with cold water to stop them sticking. Heat the sesame oil in a large pan over a medium heat and add the ginger and garlic. Fry for 1-2 minutes, before adding the prawns and cooking for a further 2-3 minutes. 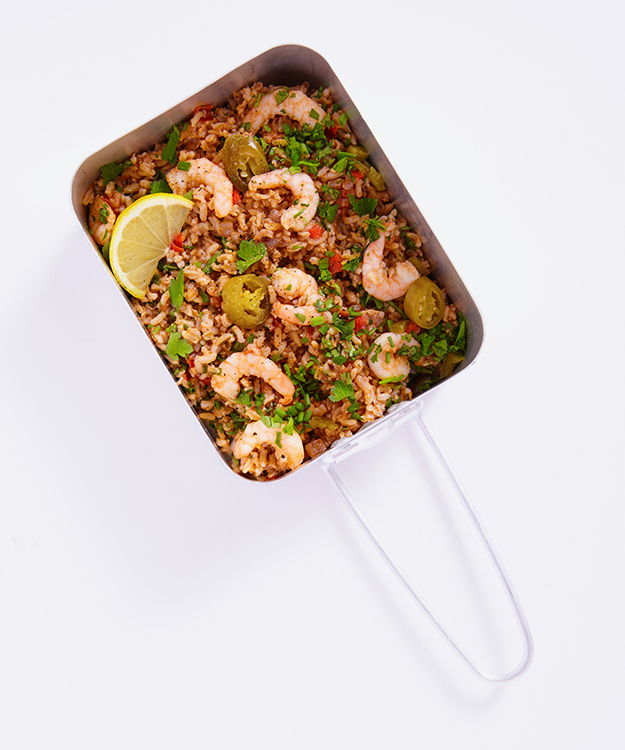 Push the prawns to the side of the pan and pour in the eggs, allowing them to cook like an omelette for 1-2 minutes before breaking up with a wooden spoon and mixing with the prawns. Add the sauce to the pan, mix with the prawns and egg then pour the noodles on top. Mix for a few minutes until everything is coated, then add the bean sprouts and half the spring onions and cook for a further 2-3 minutes. If the noodles get too sticky, add a tablespoon or two of water. To serve, ladle into a bowl and sprinkle with coriander, the remaining spring onions and chopped peanuts and squeeze a quarter lime on top. If you like it spicy, sprinkle a few more chilli flakes on to taste. 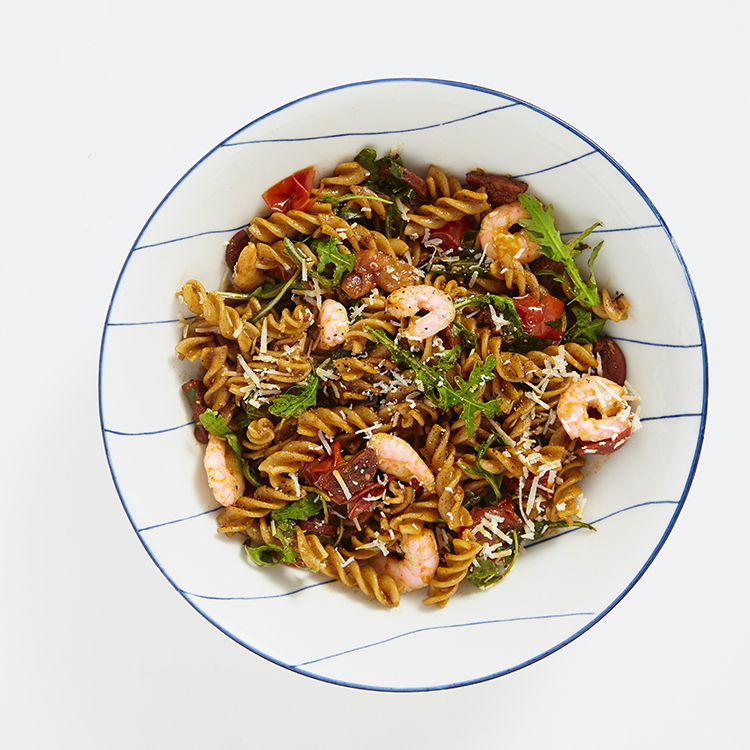 Recipe Allergens: crustaceans (prawns), gluten and milk. Cook the pasta in salted water according to packet instructions and set aside, reserving one cup of cooking water. Heat the oil in a frying pan and fry the garlic for 1-2 minutes before adding the chorizo. Cook for a further 2-3 minutes, or until the chorizo begins to release all of its oils. Add the prawns to the pan, stir to cover with the chorizo oil, then add the paprika, chilli, the zest and juice of the half lemon and continue mixing. Add the tomatoes, and fry for 2-3 minutes until they soften and can be squished with the back of a spoon. At this point, add half a cup of the pasta water, stir and continue to cook until slightly reduced. Once the sauce has thickened a little, add the parmesan, basil and black pepper, then pour in the cooked pasta and stir to thoroughly coat with the sauce. Add more cooking water to loosen if necessary. Stir in the rocket right at the end, and serve with a further sprinkling of parmesan and black pepper on top. Recipe Allergens: wheat and milk. Preheat the oven to 180°C, fan-assisted. Place the chicken legs on a baking tray and rub with a little of olive oil before sprinkling with oregano and a pinch of salt. Place in the oven, alongside the two bell peppers (standing upright) on the baking tray. Roast the chicken for 40-50 minutes until cooked and cook the peppers until blistered and collapsing. Once cooked, remove the peppers carefully from the oven, and place immediately in a plastic ziplock bag. Seal the bag and set aside for around 20 minutes until cool enough to touch. Once ready, remove the peppers from the bag, cut out the stalk and seeds and slice into thin strips. Meanwhile, slice the red onion into thin half-moons and place in a large bowl along with the red wine vinegar. Mix to make sure all the onion is coated in vinegar and leave to rest for 10 minutes. Chop the tomatoes roughly then once the onion has rested, add to the bowl along with the salt, pepper, olive oil, pepper slices and capers, and mix together. Tear the ciabatta into small pieces and toast in the oven for 3 – 5 minutes. Add the toasted ciabatta to the bowl, tossing and mixing until the bread starts to soak up the liquid. Finally, cut the mozzarella into small pieces and add to the bowl with the basil, then mix and leave the salad to rest for 15 minutes. 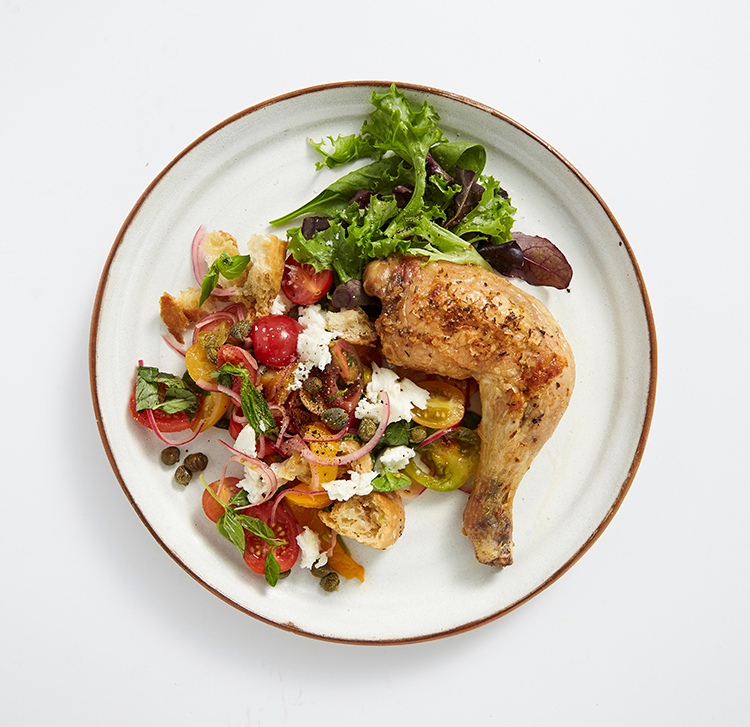 Serve with a chicken leg and a mixed leaf side salad, dressed with lemon juice. Recipe Allergens: gluten, fish and milk. 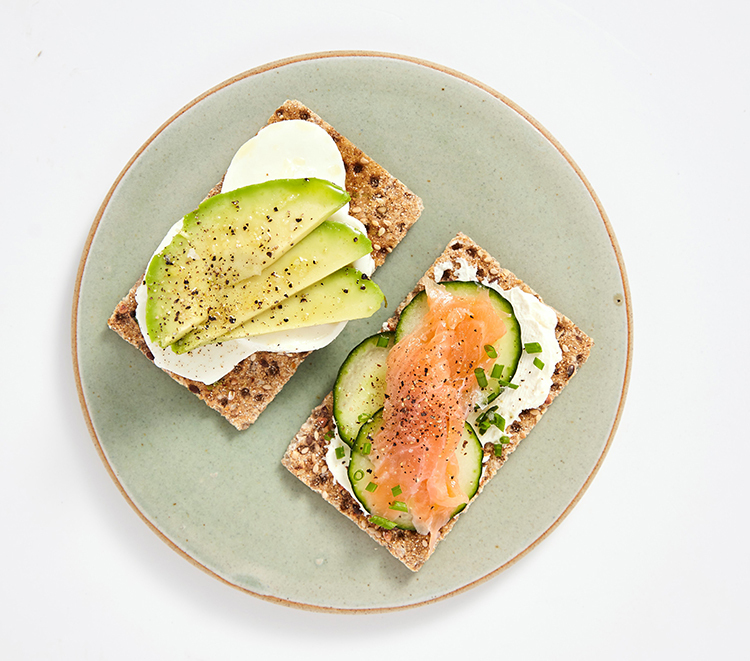 Cream cheese, before topping with cucumber and smoked salmon, followed by a squeeze of lemon, black pepper and chopped chives to finish. Mozzarella, then top with avocado cut into thin slices, sprinkle with pepper and drizzle with olive oil. 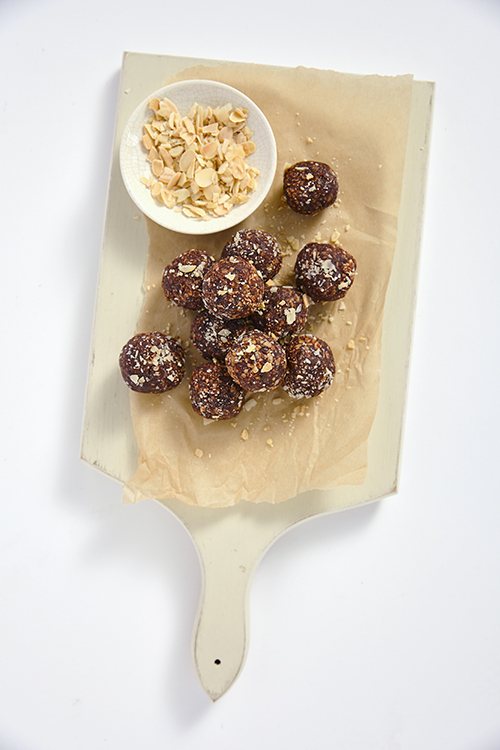 This recipe contains gluten (oats), tree nuts (almonds) and sulphites. All nutritional claims based on analysis of 100g. Lay out a piece of parchment on a baking sheet and set aside. Slice the dates in half, add to a blender and pulse until finely chopped. Add oats, two tablespoons of the chopped almonds, the almond butter and the cocoa powder to the blender, and pulse until they form a sticky mixture. Add the raspberries, then pulse briefly until blended in. Wet your hands with water, then take a portion of the mixture and roll between your palms until it forms a small ball. Place the balls onto the baking sheet, taking care to keep them separate, and sprinkle with the remaining tablespoon of chopped almonds. Leave in the fridge to set for 30 minutes before eating. This recipe contains tree nuts (almonds). All nutritional claims based on analysis of 100g. 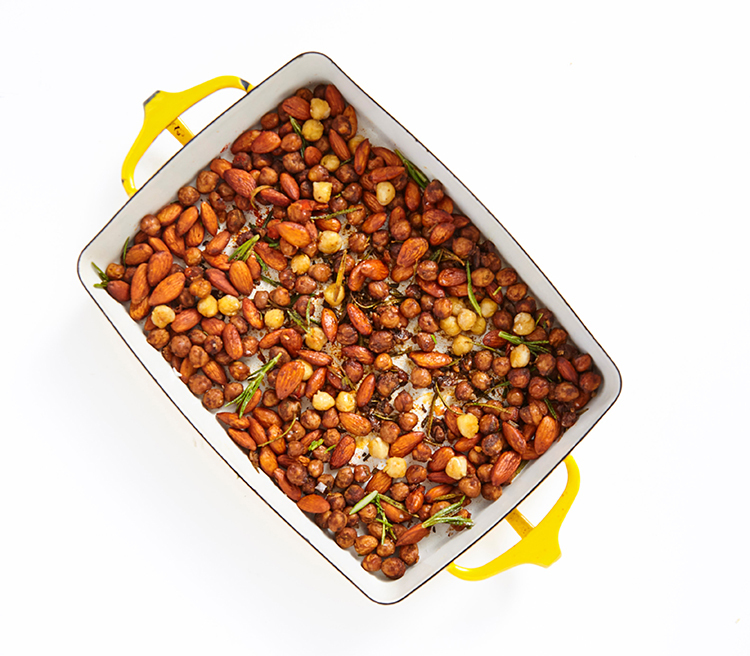 Toss the chickpeas, rosemary, cumin, paprika and pepper together on a large baking tray. Spread them out in an even layer and bake for 15 minutes until just beginning to crisp up. After this time, scatter in the almonds and give everything a good toss together. Return to the oven for another 15 minutes until the chickpeas are crisp and have caught colour. Remove from the oven, top into a bowl, allow to cool a little more then serve. 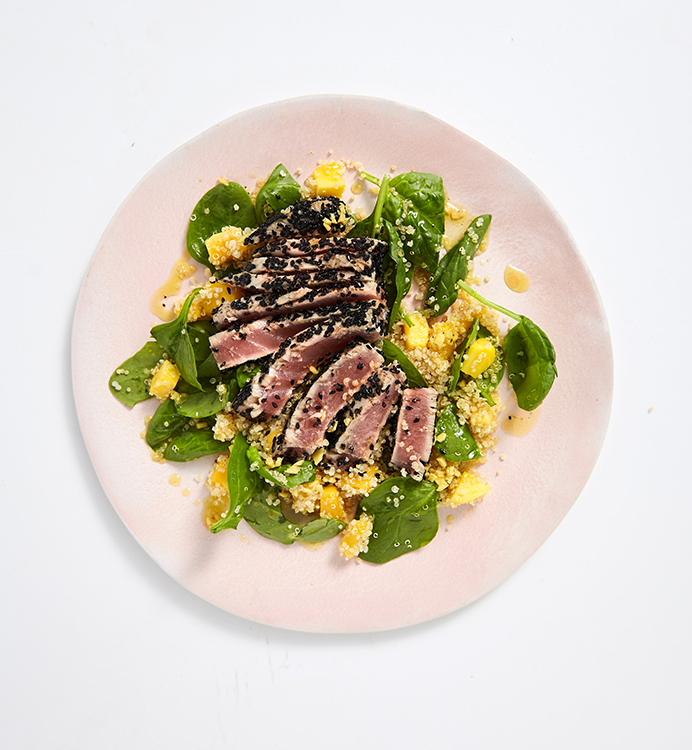 These recipes are from a selection of new recipes developed by Lorraine Pascale for Aptaclub’s Eating For 2 online resource – providing expectant mums with nutritional advice during pregnancy. To find out more, visit Aptaclub.